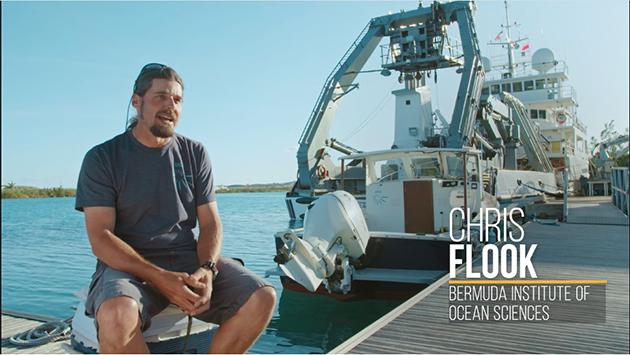 BIOS scientist Gretchen Goodbody-Gringley and staff member Chris Flook appear in a documentary film, showing this month at the Bermuda International Film Festival, about the challenges of invasive lionfish—and the creative solutions in development to curtail their spread. The 16-minute film, titled “Lionfish: from Predator to Plate,” was shot in April 2017 before the start of the America’s Cup sailing race in Bermuda. Created by 11th Hour Racing, sustainability partner of the British America’s Cup team Land Rover BAR, the film was developed after meetings with the island’s local scientific and environmental organizations to identify critical, local environmental issues, and to support Bermuda’s ongoing efforts in this field. The film, shot entirely in Bermuda, tells the story of the innovative solutions developed to combat the spread of lionfish, including deep-diving robots that stun and collect the spiny creatures, said communications director Alessandra Ghezzi with 11th Hour Racing. 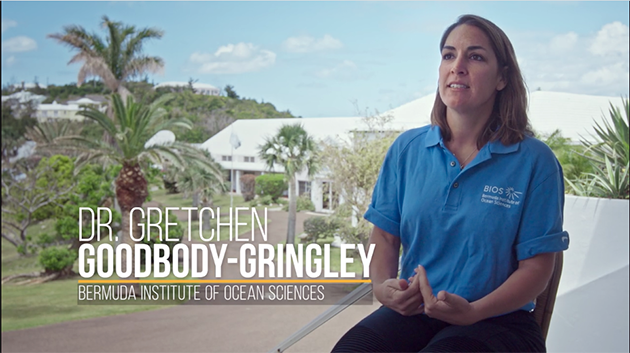 In the documentary, Goodbody-Gringley and Flook, as well as other island researchers, share knowledge gained from their ongoing studies of the lionfish problem, including statistics about their voracious appetites and rapid reproductive abilities. “They do produce quite a lot of eggs—30,000 eggs every four days,” Goodbody-Gringley said. “So the big fear is that, if left untouched, we’re going to have a bunch of lionfish and not much other diversity on the reef,” Flook said. The film culminates with the gathering of celebrity chefs and six America’s Cup sailing teams at the National Museum of Bermuda for a cooking competition. Leading chefs representing each team competed to prepare the best lionfish dish, from ceviche to lionfish and chips. Skippers from each team served as the judges. “The event was designed to transform lionfish into an enticing and sustainable seafood choice for menus worldwide, and increase market demand for this invasive species,” Ghezzi said. The film will also appear later this month on the 11th Hour Racing website.